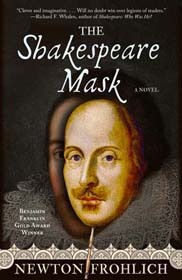 Award-winning novel "The Shakespeare Mask"
What if the author of the greatest works ever written in the English language wasn’t who we think he was? In the sixteenth century, a precocious young nobleman draws the attention of the Elizabethan court—and of the Virgin Queen herself. A writer and patron of the arts, Edward de Vere is volatile, controversial, and brilliant. He leaves a trail of women and scandal in his wake. But his plays, when he’s in the queen’s good graces, charm the court. His sonnets turn feelings into sound. Yet the rules of the court say a nobleman may not publish. An earl’s name is too sacred for the theater. If de Vere must write, he must do so anonymously. He must employ an almost-illiterate glove-maker from Stratford as his “mask,” a man we know today as Shakespeare. 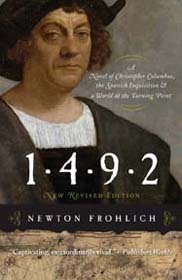 Newton Frohlich, author of the celebrated historical novel 1492, spent fifteen years researching the true identity of the poet and playwright who penned the most beloved works of the English language. The result is this award-winning novel—an ingenious and intimate portrayal of the complex man who a growing number of prominent scholars, writers, and actors believe wrote the works of Shakespeare. From the intrigue of the English court to the romance of Venetian canals, the magic and mystery of The Shakespeare Mask will keep you turning pages well into the night. Learn more about life in Tudor England, and find out what well-known individuals have raised questions about the true identity of the man called Shakespeare. Are you a writing group, book club, or Shakespeare society? Invite Newton Frohlich to speak to your group. Contact him for details.